But to realize that dream, you’re going to need a landing page creator. Leadpages is one such tool. And in my Leadpages review, I’ll dig into whether or not it’s the right tool for you and give you a real look at how Leadpages functions. 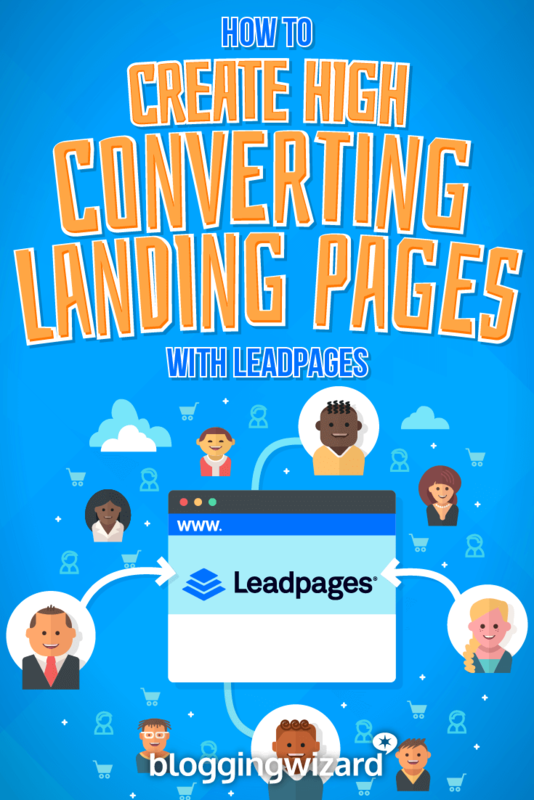 Overall, I’m impressed by the ease of use and functionality that Leadpages offers. But let’s not jump too far ahead! I’m definitely going to go more in-depth with these features later on. But because Leadpages includes a few separate, but connected features, I thought it would be helpful to do a quick dive into the features before I actually go hands-on and show you around the Leadpages interface. 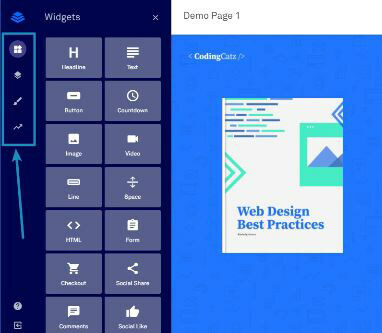 Drag and drop editing – In 2016, Leadpages completely redesigned its editor to offer drag and drop and the new experience is intuitive and glitch-free. 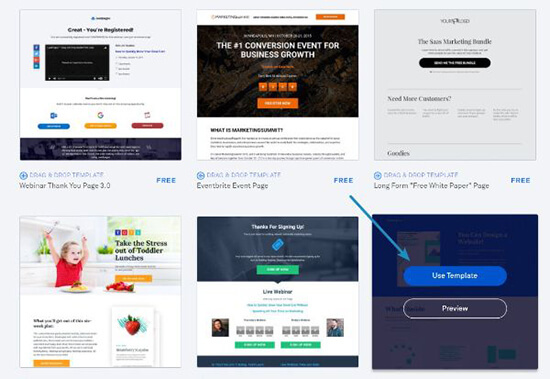 130+ free templates + a huge marketplace of paid templates – These help you quickly spin up new landing pages because all you need to do is edit the text and hit Publish. Tons of marketing integrations – Easily connect to your favorite email marketing service, webinar tool, CRM, payment gateway, and more. Hosted landing pages – Leadpages hosts all of your landing pages for you, though you can still use your own domain name. Tons of website integrations – Leadpages also makes it easy to hook up to your website. For example, there’s a dedicated Leadpages WordPress plugin, as well as tons of other website integrations for Squarespace, Joomla, and more. 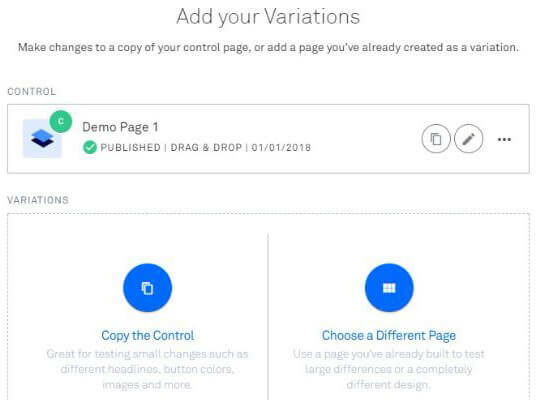 Easy A/B testing – You can quickly spin up a new split test to see which versions of your landing pages perform the best. 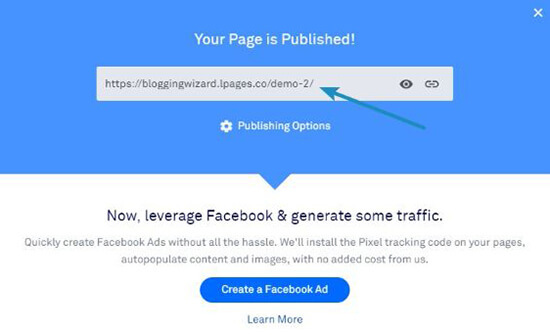 Detailed analytics – Not only does Leadpages provide in-dashboard analytics, but it also makes it easy to get up and running with Facebook Pixel, Google Analytics, and more. 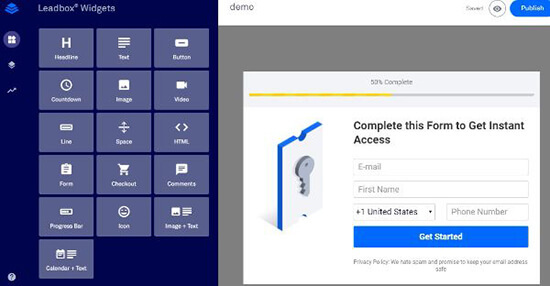 Leadboxes – Custom designed pop-up forms that you can display automatically or based on a user’s actions. You can even link a button that you create in the landing page creator to a Leadbox to easily create a conversion-boosting two-step opt-in. Leadlinks – These allow you to sign up existing subscribers to an offer in one click. For example, you can sign them up for a webinar or a sublist just by sending them a link. 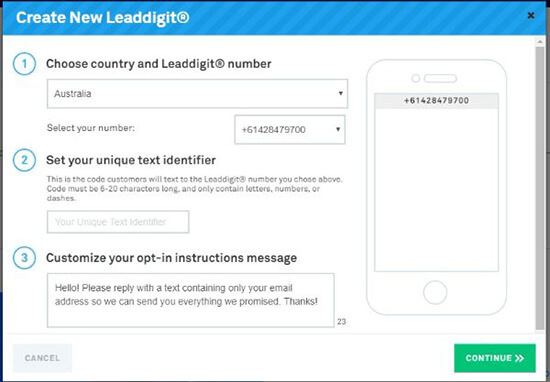 Leaddigits – This one is a bit more niche – but it enables your leads to opt in to your email list or webinar via their mobile phones and automated text messages. While the landing page creator is still the core value, these smaller additions can help you do some neat things and also integrate well into the landing page builder. Now that you know what to expect on a theoretical level, let’s make this Leadpages review a little bit more…hands-on. That is, I’ll actually take you through the interface, give you my thoughts, and tell you how you can apply Leadpages’ features to your own business needs. Then, Leadpages will ask you to choose from the 130+ free templates. They also give you an option to switch to the old Standard editor (as opposed to the new Drag & Drop editor). While it’s nice to have the flexibility, the older experience is inferior to the redesigned editor, so I recommend that you always stick with the default Drag & Drop templates. Fun fact – this template is pretty similar to the template used on Blogging Wizard’s VIP Blogging Resources page. A page which is, uncoincidentally, built with Leadpages! Once, you choose a template, Leadpages asks you to give the page an internal name and then throws you right into the drag and drop editor. If you’ve ever used a WordPress page builder, you should feel right at home in the Leadpages editor. Widgets – These are the building blocks of your page. For example, if you want to insert a new opt-in form or a button, you’d use a widget. Page Styles – This tab lets you choose fonts, background images, and more. For each widget that you use, you can also access settings unique to that widget. So how easy is the Leadpages editor to use? All in all, everything is pretty intuitive and, most importantly, code free. That is, you should be able to build good-looking and effective landing pages even if you’ve never looked at a line of code in your entire life. If you’re building landing pages, you’re probably planning to put at least one call to action (CTA) on the landing page, right? At least I hope so! Smart use of a CTA button is an essential part of landing page optimization. Because it’s so important, I want to give you a bit of a deeper look at Leadpages’ Button widget. But the outermost options unlock some interesting options. While not a huge deal, this makes it easier to create stylish buttons without needing to know a ton about design. 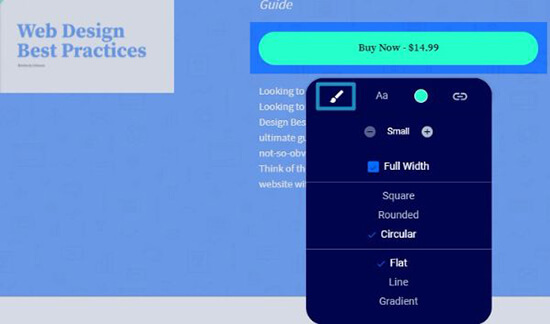 For example, some other landing pages would require you to manually set the radius and shadows to achieve these effects, but Leadpages lets you do it just by selecting a preset option. This is a feature that I love in Thrive Architect, so it’s great to see it make an appearance in Leadpages as well. This is super helpful because you can use it to easily create two-step opt-ins, which are an effective way to increase your conversion rate. 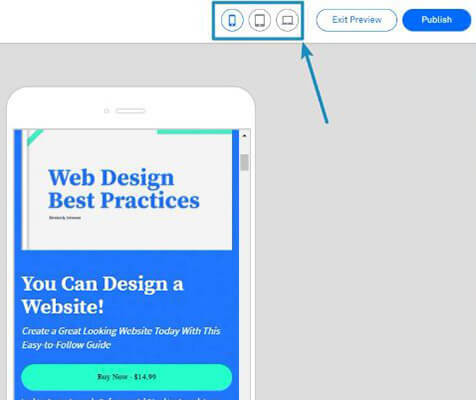 With a two-step opt-in, your visitors click on the button to open a new pop-up with the signup details, rather than you just displaying those details on the page from the beginning (you can see this in action by clicking the CTA on the aforementioned VIP Blogging Resources page). Leadpages makes the technique easy. And it’s also flexible because you can custom design each and every one of your popups using the same drag and drop editor (more on these later on in the review). Another thing that you’re probably going to want to do on your landing pages is to display some type of form, right? 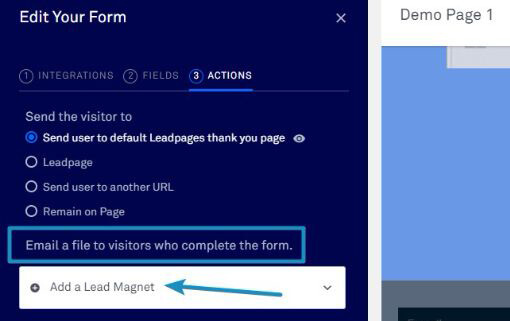 With the Leadpages Form widget, you get detailed control over all of the forms on your landing pages. And Leadpages even has plans to integrate upsells and downsells, though those features are still on the roadmap. You probably know about the importance of mobile traffic, which is why you should want to make sure that your landing pages look just as good on mobile devices as they do on desktops. This brings me to one small criticism, though. This is only a preview. You can’t actually design your page according to the responsive settings, which is something that Instapage lets you do. While Leadpages is pretty good at making your designs responsive, some extra control here would be nice. But leaving it on a subdomain isn’t the most professional look, so you’ll probably want to actually integrate it into your site so that you can use your own domain name. Leadpages gives you a ton of different options to do that, including a dynamic HTML option that should work for most sites. There’s a dedicated WordPress plugin. Once you click that button, you’ll be able to choose your control page and then add different testing variations as needed. And you can also choose traffic distributions to control how much traffic goes to each variant, which is a nice bonus feature. While you’ll still probably want to use a more detailed analytics service, these are helpful for getting a quick look at the health of your landing pages. As I’ve already mentioned a couple of times, Leadboxes are popups that you can either trigger automatically or based on a specific action (like a visitor clicking a button). When you publish the Leadbox, you’ll be able to choose how it’s triggered. What’s nice is that through these options, you can easily integrate a Leadbox in content that isn’t a Leadpages landing page. For example, you can use the plain text link to include a two-step opt-in in a regular WordPress post or page, which gives you a good deal of flexibility. You probably won’t rely on these as much – but they let you do some pretty neat things. 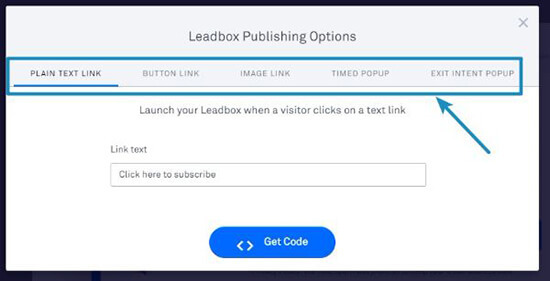 With Leadlinks, you can create a link that automatically signs subscribers up to a sublist or webinar with just a click. This is handy for, say, sending an email blast to your subscribers about an upcoming webinar. Rather than requiring subscribers to enter their information again, you can just sign them up as soon as they click the link. Less friction means higher conversions! This is probably the most niche feature – but if it fits with your audience, the functionality itself is pretty cool. So…how much does Leadpages cost? If you want those features, or some other more advanced features, you’ll be looking at one of the pricier plans which start $48/month (billed annually). Note: their pricing & features do change from time-to-time so it’s worth checking their pricing page for the latest. Should you use Leadpages to build your landing pages? Functionality wise, I think Leadpages is great. It’s definitely a more powerful experience than a WordPress page builder. The only confounding factor is its price, which is pretty hefty in comparison to a WordPress page builder solution. 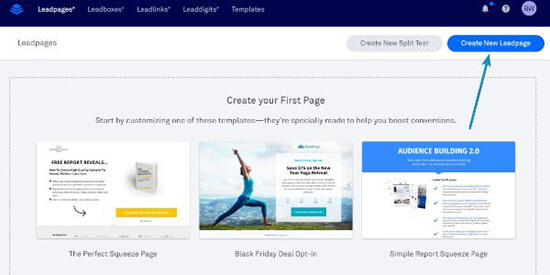 If you want a super easy way to create gorgeous landing pages across multiple sites, as well as advanced features like Leadboxes, tons of integrations, and A/B testing, Leadpages won’t let you down. You just need to make sure that those features are generating a good ROI for you, either in terms of increased revenue or time saved. You don’t have to guess, though – Leadpages offers a 14-day free trial, so you can sign up and see if the extra features are worth the added cost. Summary: Leadpages isn’t the cheapest way to build landing pages without custom code, but it is one of the most convenient and flexible. If you’re willing to pay, its features will make your marketing a lot easier.